Hurricane Harvey viciously attacks the state of Texas. Hurricane Harvey is now known as one of the most destructive storms in the nation’s history. Hurricane Harvey destroyed houses and turned what were once known as neighborhoods into lakes. 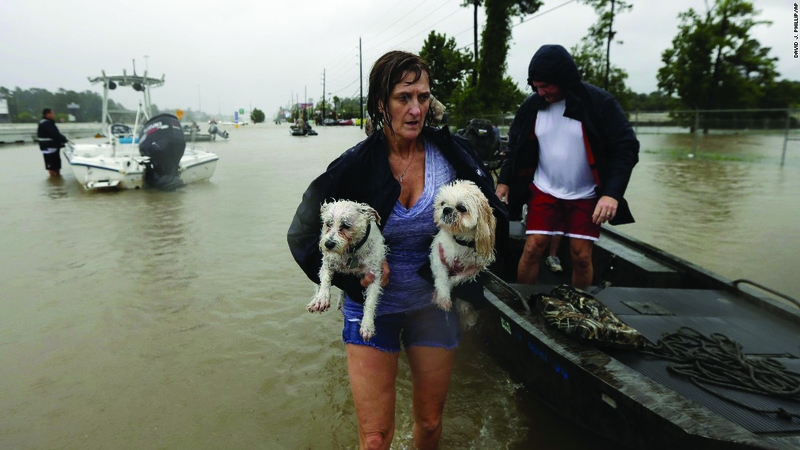 The powerful hurricane had 130 mph winds, and made landfall near the city of Rockport, Texas. Houston, Texas struggled to survive with over 50 inches of rain bringing in massive flooding into the city. This massive storm made two landfalls. Rivers will remain high for the next several days, it will takes years for Southeast Texas to recover from this tragedy. What started off as a tropical depression in the Gulf of Mexico, on Wednesday August 23, quickly turned into a category four hurricane and went straight into Texas. There are 46 possibly related deaths to this storm. It is estimated that there are around 100,000 homes in Texas and Louisiana that had been damaged or destroyed. To make matters worse, this massive storm brought in several tornadoes, which made survival difficult for the residents who sought refuge in their attic to escape the rising flood waters. A total of more than 500,000 cars fill the now flooded streets, with nowhere to go. “And residents returning to their homes are now dealing with mold issues and disease-carrying mosquitoes”, wrote CNN journalists Doug Criss and Martin Savidge, in ‘Out of the Spotlight, Hurricane Harvey’s victims struggle to recover’. Slowly residents are returning to what used to be their homes, only finding destruction in every corner. Thousands of Texas residents went online, desperately requesting for help. Emergency responders quickly tried to get access to the residents by sending rescue boats across all the flooded streets, giving some relief to the devastated cities. A shelter that contained hundreds of people, quickly became flooded with water. The amount of destruction and loss is something unbearable to hear. “I was worried that we would run out of food and water since we didn’t stock up…” said Kassandra Elias, a hurricane Harvey victim, in a phone call with Kelsea Frederick, a Suncoast student. It is important to be prepared during an event this devastating, yet people chose to still remain as if it was just another thunderstorm. Through all of the destruction, celebrities are stepping up and donating thousands to millions of dollars for the Hurricane Harvey victims. Comedian Kevin Hart donated $25,000 to the RedCross foundation, he also nominated other celebrities to do the same. Millions of dollars have been donated to the recovery of these poor victims and the number of donations is only rising. The road to recovery may be long, but the efforts of everyone only brings all the hurricane Harvey victims closer to a normal life once again.